It’s Dateline July 1 2021. Policy consultant and NFP leader, Moira Deslandes takes a look back at a list of the Top 10 decisions from the future that helped Not for Profits survive in 2014. It’s 2021 and the NGO of the Year award has been announced. You are the CEO of that NGO, and as you prepare for your acceptance speech you think back on the decisions, opportunities and accidents that came the way of the agency long before you joined them. It’s the first anniversary of you working for them, so you want to make sure you thank those who have gone before. After all, it’s someone else’s work that you are harvesting and it has taken seven years to get there. You make a list of the Top 10 decisions you believe got the agency to where it is to receive the award. There were many decisions to choose from! All agency food services – a meal service for the homeless and three aged accommodation services – would apply the 100 kilometre rule, providing only foodstuffs that were grown within a 100km radius of your outlets. This built new relationships with households and small providers and created the abundant harvest network; an unintended outcome that linked community gardens, foragers and schools together (and, as an aside, in 2019 won the Stephanie Alexander award, and was voted best TED talk by a community in 2018). The agency would take five years to move to renewable energy use. This decision opened up new opportunities and the partnership that had been formed with an employment agency in the post-Holden demise packages meant that affordable energy credits were available to everyone, not just clients of the agency. The business model took a while to get right and there were some early financial losses, but the underwriting by the Holden package, the commitment of leadership and support from the major power provider made it possible. Closing down three of the major buildings staff were housed in was a difficult decision, with some staff very reluctant to make the transition to totally mobile platforms. Everyone got a mobile device and space was hired at central hubs in other people’s buildings including the Adelaide Hub. What was cynically seen by some staff as a way to save money soon was understood as a way to build more collaboration, opportunities for co-design and spontaneous networking across disciplines. This transition was made over time, after the decision in 2017 that no new staff would be allocated a desk or car park or a physical location to work, but rather a list of places to work, including home. The agency was awarded the NAB teleworking prize for best practice and the human resources lead for this project is now working in California for Google. Governing arrangements also changed and now getting onto the agency’s board is one of the most sought after seats in town! A couple of innovations included the random selection of two board members every three years from amongst the pool of registered citizens. The randomly selected board members are provided with training, support and mentoring. The voluntary nature of the role has continued, although this remains a hotly contested conversation. Participatory budgeting came to the youth program in 2018. A deal was struck amongst all the agencies supporting young people, and the State Government and a state-wide engagement process was developed. Then the funds were allocated as directed by the under 25s. Everyone had been nervous at first, however the innovations that followed helped confidence grow and the World Bank expert on participatory budgeting gave the concept a big tick in his article in the October 2019 Harvard Business Review. After that, annual internships and training were offered to replicate the model and 100 places are now offered every two years, generating $100,000 income that goes straight back into the program. Micro-volunteering was pioneered firstly in social media education and information campaigns, but was quickly adapted and adopted in a whole range of programs such as financial planning, personal counselling and domestic violence support. The idea of having an annual hack-a-thon and prize to develop a community services sector app had been a huge hit. Who would have thought that all the data could be unleashed to generate income as well as inform legislators? In 2017, the annual social impact film that replaced the hard copy annual report was so popular that it was submitted as part of the South Australian bid to host the 2020 International Social Good Summit. Needless to say Adelaide won and hosting the event attracted new investors to the Ideas Bank that was established for small innovation grants. The foundation funds for the Ideas Bank had come from the sale of property and a generous donation from a former Board Member (who was on the Board in the 1950s, and it was a huge surprise) who bequeathed 10% of their estate to the agency. Recruitment of staff embedded volunteering into the selection criteria in 2016 and this meant that the transition to paid employment ensured shared vision and new pathways for younger volunteers. Exiting staff often returned to the volunteer mentoring pool, mentoring other organisation’s staff. This idea really took shape when the mother of a past CEO took it on as her personal project – she had a deep interest in how knowledge and skills could be transferred and measured. As a former academic she partnered with one of the international universities domicile in Adelaide and got a five year study underway to measure the health and wellbeing outcomes for both mentor and mentee across the generations. The agency is a preferred provider and three major national companies (a merchant bank, a bio-tech company and a property developer) have embedded 30 hours a year of mentor volunteering for all staff with the agency. This has brought huge benefits and projects that would never have been able to be undertaken without this extra intellectual capital and networks. Licensing and then franchising the business model for remote delivery of a range of educational services seemed like a good idea at the time, but the competition in that space had been fierce and so taking the decision in 2017 to get out of that space was a very good one! The lessons learnt about producing online content were invaluable and enabled the team who had been working on this to be dispersed and influence education providers in their space. The fusion of education and information continued internally and education was no longer seen as independent and discrete from all the other services on offer. Building poetry, improvisation and play into every staff encounter had first seemed crazy. Over time staff learnt how to connect in unexpected and fun ways. Coming up with ideas that had first been presented in gibberish were tracked by an Honours Drama student in 2019 and he won the University Medal for his thesis. The methods released creativity and connectivity and were led by the annual Artist-in-Residence funded from a combination of philanthropic and crowd-funded sources. Some of the techniques were embedded in the Social Good Summit program and were also applied directly in service delivery. As you come to the end of your reflection you recall the French poet Paul Valery saying: “The trouble of our times is that the future is not what it used to be”, and you are grateful that you didn’t follow; you led and created the future you wanted for the Not for Profit sector. About the author: Moira Deslandes has worked from the kitchen table to the cabinet table as a direct service social worker, to Chief of Staff to a minister in Government. 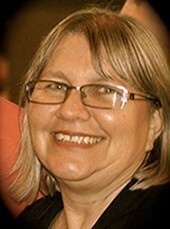 She is currently the Senior Policy and Carer Engagement Officer at Carers SA.